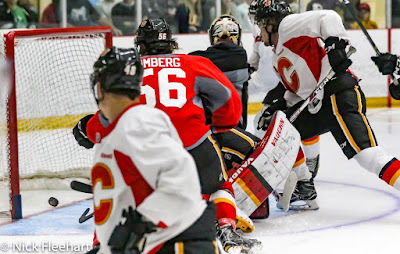 Calgary Flames development camp wrapped up Friday morning with its signature event: The scrimmage. It was Team Conroy (Red) versus Team Gelinas (White) as two teams of 17 skaters battled each other in an energetic affair before a packed crowd at Markin MacPhail Arena at WinSport. You know you're in a hockey market when on a sunny Friday morning in July, while going up against the Stampede Parade, the red Flames jerseys come out en masse as curious observers young and old quickly filled up the limited seating capacity and then spread themselves out around the rink at ice level to watch these kids ages 18-23 showcase themselves. Twenty-four of the 40 players at the camp are Calgary Flames property. They'll be back in town again in couple months. The other 16 on try-outs were hoping to do enough to earn an invite to rookie camp in early September. Was it a real game? Not really. Playing two halves was the first sign that this was not a normal hockey game. That's not necessarily a bad thing. A shootout at the end of each half certainly provided a bit of spice. The game began at five-on-five, but eventually, the opened up the ice by going to four-on-four. Next came some three-on-three -- not exactly the style of hockey built for Hunter Smith but the 6-foot-7 giant nonetheless took his turn. In addition, each team had seven minutes of power play time just to make things interesting. This was independent of actual penalties, which resulted in penalty shots. All in all, it offered plenty of entertainment for those with nothing else to do, or those just curious for a glimpse of Spencer Foo. This is the part where fans close their eyes and imagine three, four, five years into the future when a couple of the pairings deployed Friday morning might be real-life pairings on Calgary's NHL roster. With the big left-shooting Finn manning the left side and the smart right-shooting American on the right side, what a solid top-four pairing they might form one day and they looked the part on Friday morning. Valimaki, Calgary's first round pick in the 2017 draft, is quite a presence on the ice. A big body in front of his net, he's a smooth skater who is crafty with the puck. Listed at a generous five-foot-11, Fox is not a big guy but he's not tiny either. The Harvard kid selected in the third round a year ago is going into his second year at the prestigious Ivy League university. He uses an active stick to help him take away passing lanes. When he gets the puck, good things happen as he's got great vision and after surveying his options, he'll zip a pass to an open man and away his team goes up the ice. Making his first appearance in Calgary, Valimaki in particular was the subject of great interest and you can see why the Flames are so high on him. He scored a beauty of a shootout goal in which he cut in off the wing, slipped the puck through his legs and onto his backhand as he neatly tucked it inside the post. Late in the game, he threaded a cross-ice backhander while under pressure onto the tape of Eetu Tuulola, who buried an empty net goal to clinch the win for Team Conroy. When I saw the teams, I wondered if they might pair these two up together and sure enough, there they were in the opening line-up with the scrappy Ryan Lomberg on the other wing. There's a lot to like with both of these speed demons and for more on each of them, I get into more depth below. 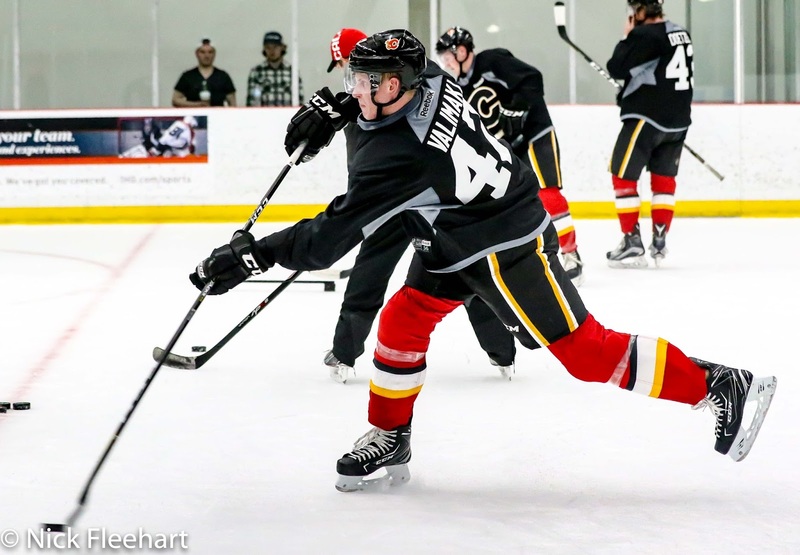 Regarding the other four draft picks selected after Valimaki two weekends ago, two suited up in the scrimmage. Unfortunately, minor injuries sidelined the other two. These are two big dudes -- Ruzicka at 6-foot-4 and 210 pounds, Fischer at 6-foot-2 and 200 pounds -- who were both very involved in the play. For one, they each had offensive chances. In Ruzicka's best chance, a neatly executed give-and-go with Rasmus Andersson led to Ruzicka being set up perfectly in the slot, but he fired his shot over the net. The rugged Fischer scored one of the goals and it was a beauty. Skating away from the net, he pounced on a rebound, spun and in one motion zipped a shot top corner, over the glove of Mason McDonald. They also each took a turn extracting their pound of goaltender flesh. Ruzicka collided heavily into Parsons sending everybody including the net flying. He got tagged for goaltender interference and to the relief of all, Parsons emerged from the collision fine. Obviously feeling bad, Ruzicka made a point of twice circling back and giving Parsons the apology stick-tap to the pads. They played each other in the OHL last year -- Ruzicka with Sarnia and Parsons with London. Shortly after, Oliver Kylington's awful giveaway at his own blueline led to a breakaway for Fischer, who got hauled down by the Swede but in the process, both of them slid on the ice and barrelled into Parsons. Fischer, who turns 20 in a couple weeks, told me earlier in the week, "I like to fight." No kidding. When your PIMs with Medicine Hat (WHL) go from 15 a year ago to 145 last year, that certainly speaks to a change in identity. Fischer said he put on 27 pounds last summer on his way to re-inventing himself. Both the QMJHL product and the Swede were held out of the scrimmage due to minor injuries. In total, three of the 40 that attended camp did not suit up for the game. 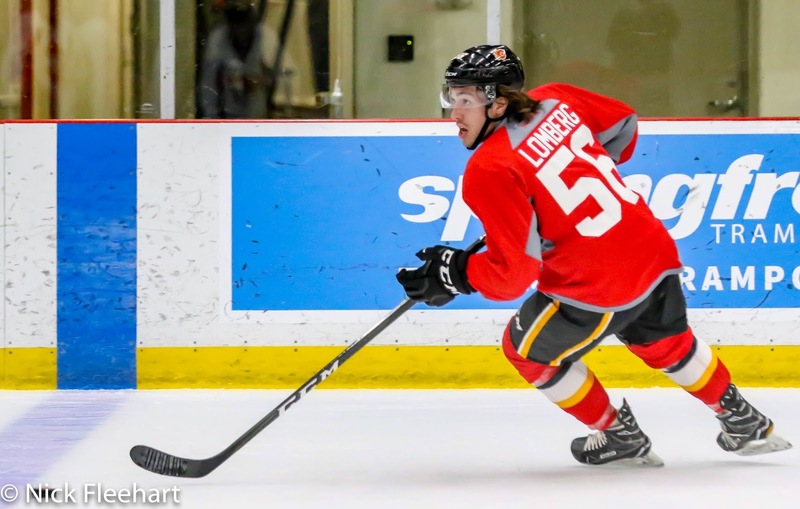 The other was 2016 fourth rounder C Linus Lindstrom, who is coming back from a medical procedure on his knee. It was good enough to allow him to participate in the skills development sessions on Wednesday and Thursday, but the team didn't want him risking it in the game. Whenever you watch a game featuring Kylington, you end up seeing a lot of Kylington. It's also not for the feint of heart. More noticeable most nights than any other player is the smooth-skating Swedish defenceman wearing No. 58. 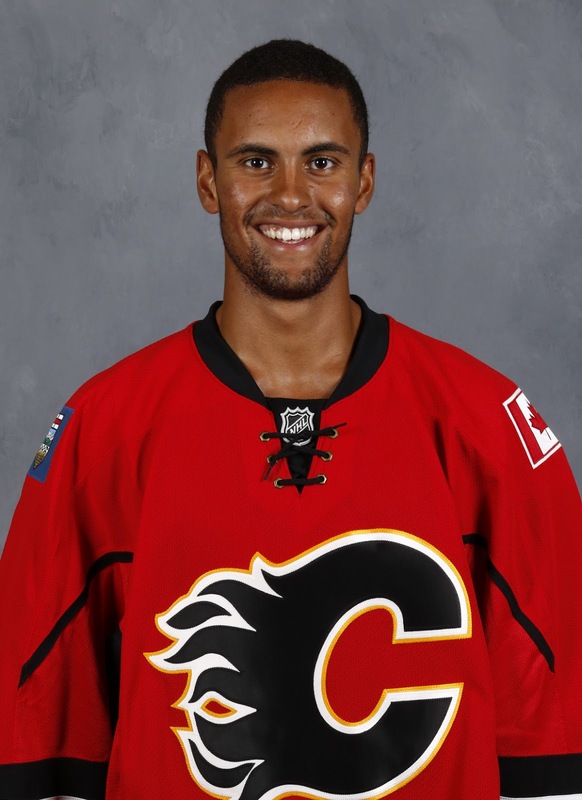 However, he's not always noticed for the right reasons and it's been a trend throughout his time in the Flames organization. 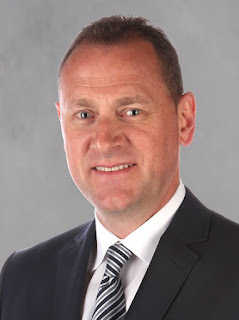 "I think he's taken significant strides forward," said general manager Brad Treliving in his post-camp address. But then he added a qualifier to Kylington's situation. "Under normal circumstances, he would be playing in the Canadian Hockey League. And here's a guy at 18 and 19, who has two years of American Hockey League. You can see where he's matured." If we learned anything on Friday it's that Kylington still makes too many careless or unnecessarily high-risk decisions or moves. "You see, even in scrimmages like today, what could be greatness. 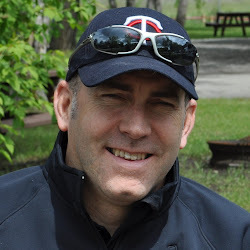 Then you see the ones where you want to grab him by the scruff of the collar," said Treliving. Always active like a Golden Retriever at an off-leash park, Kylington ends up roving around the ice a lot. End boards, far corner, you never know where he'll be and he has some high-end skill. He scored a nice power play goal and right afterwards could have notched another from a similar spot. In another display of his raw talent, he darted towards the net, toe-dragged the defender (Sebastian Vidmar) who nearly corkscrewed himself into the ice, and had a close-in chance. You watch him skate and carry the puck and it's mesmerizing he's so smooth on his blades. But then come the turnovers. As last man back, his previously mentioned cough-up to Fischer nearly resulted in a goal and an injured goalie. 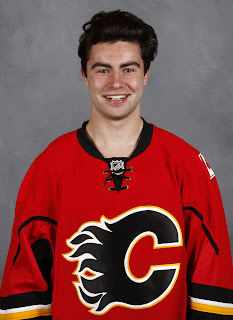 On a three-on-one with Dillon Dube and Poirier, one too many moves resulted in him coughing up the puck and away went the Whites on an odd-man rush the other direction. 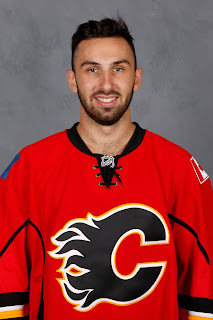 Sometimes when he makes mistakes, he's so fast that he can get back to take away the danger, but it's an adventure far too often when he's on the ice and he won't be in the mix for a job on the Flames blueline until he can improve his decision-making. All that said, he just turned 20 and that's not something to overlook. The rest of his game you like so you have to remind yourself that he's still a young man playing a difficult position and having done so in a more difficult league than most players his age are playing. "You have to pause every now and then and say there's not too many 18 and 19-year-olds that go right into the American Hockey League and do as well as he's done," said Treliving. His skating ability remains the concern but for what Swedish blueliner Adam Ollas-Mattsson lacks in speed, he certainly makes up for in physical and aggressive play. Paired with Andersson all scrimmage, Ollas-Mattsson is like Dolph Lundgren on skates, constantly punishing opposition players and without seeming to exert much effort. Go down his side of the ice and if you don't get around the corner, you're going to be wallpapered into the end boards and it's going to be loud. It's always loud when he hits, even in Friday's scrimmage. "It just comes normally," said the 6-foot-5, 220 pound Nordic monster. "You try to hold back a little bit, just because it's a scrimmage, but sometimes you can't." We're not sure yet where Ollas-Mattsson will play in 2017-18. He has played for Djurgardens in the Swedish Hockey League the last three years but his contract expired after last season. He then signed an amateur try-out and came over to Stockton and jumped into their line-up for nine regular season games down the stretch. "A great experience for me," said Ollas-Mattsson, who turns 21 later in July. "I like North American hockey more. Smaller rink, a little bit faster, a little bit more physical, I'm more comfortable with the physical play." Treliving is not sure yet how it will unfold. "We've got his rights for one more year. We're going to talk with him a little bit over the next day or so," he said. "His options are he can sign an entry-level contract with us, or he's got opportunities to go back and play in Sweden." Treliving likes him, it's just the foot-speed that is the issue. "He's got excellent hockey sense, he makes those little plays with the puck, he's got a little edge to him. The question with him is his skating," said the GM. "That's the challenge for him. He thinks the game so well, he's a big man, we'd like to have him in North America but we'll see how that all plays out." He also had a couple good scoring chances on Friday. A slick pinch at the blueline ended up springing him in alone, only to be thwarted. Later on, he had a dangerous chance in the slot but whistled a shot wide. Boom off the glass the puck went, just like the sound of his board-rattling hits. On Wednesday, I wrote about frisky defenceman Josh Healey, the Flames free agent signing last spring, who comes to Calgary after four years, countless number of hits and multiple suspensions at Ohio State. From a college famous for its college football, Healey was in linebacker form again in the scrimmage. When it's what you do, it can be hard to tone it down, apparently. Early in the game, the 6-foot-0, 195 pounder demolished Tuulola into the corner boards. No small lad himself at 6-foot-2 and 230 pounds, Tuulola did not look very pleased as he slowly left the ice. Later on, maybe related, Healey had a verbal exchange with giant 6-foot-4 defenceman Sam Ruopp, a Blue Jackets 5th round pick in 2015, who was in camp on a try-out. That's how long it took Poirier to make a statement that he is back. First, he darted down the wing and behind the net and almost scored on a wraparound. Seconds later, he laid a heavy lick on try-out invitee Alex Smith along the end boards. Speed plus snarl. This is the Poirier of old. "It gets a little intense and I just wanted to do something out there," said Poirier. "I didn't feel like I was doing anything the first shift and that gets you into the game." He wasn't done yet either. Far from it. Busting through the slot to the net, he had Mitchell Mattson's pass bounce over his stick. Later, again showcasing his speed, he wheels around Andersson on a one-on-one and then cuts hard across the face of the crease, nearly stuffing the puck behind Parsons. "You have to be careful in July of getting too high or too low, but in his circumstance, he looked like he had the fire back. To see the explosiveness back in him, the smile on his face, we're real happy for him," Treliving said. "Don't bet against that kid." Ryan Huska took over as coach in Stockton in Poirier's rookie season three years ago. So he knows the young man very well. He says as soon as he arrived for this week's camp, he could tell Poirier was a changed man and in a good way. A very good way. 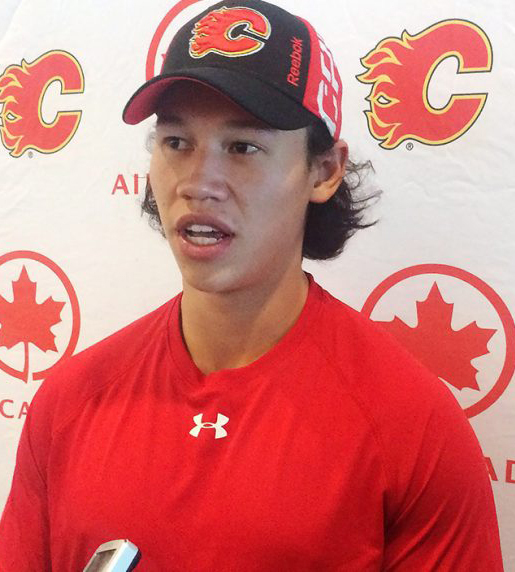 "Right from the first time I saw him when I got to Calgary, he looked like a different young man, which was something that really excited all of us," said Huska. "He's got a weight lifted off his chest and shoulders and just coming back, I think he realized how much he loves the game, how much fun he has being at the rink again and being around his teammates." If Wednesday and Thursday's skills development sessions were the trailer for Poirier's return to form, Friday was the feature film. "His speed is the real strength in his game as he can get himself from 0 to 60 in no time. He has the ability to be on top of defencemen in a hurry and therefore creating a lot of turnovers," Huska said. "The speed when he's at his very best, he's a very hard guy to handle. We saw little bits of it here today in this morning's scrimmage. It's July but you do see how effective that can be in a lot of different ways." Poirier says training camp in September is on his mind "every day" and he looks forward to it. "That's my game, I'm trying to do my game, even if it's in July. I just have to keep it going through the summer and come to camp and do the same thing." "He's been in the organization for four years now, but he is a young guy and he has a lot of game in front of him. Seeing him here this week has made everybody feel pretty good," said Huska. "It looks like he's in a really good place right now so we're really proud of him." Ahh, so that's what all the fuss has been about. The player a majority of fans were most excited to see in person was highly-touted free agent signing Spencer Foo. With Union College games rarely making an appearance on Calgary television, Friday was the first chance for many to see Foo in action. It didn't take long to realize that this is a guy in which the word 'quick' applies in all facets of his game. You notice that the puck is on and off his stick quickly. When he gets in flight down the wing, he's quick. And his hands... you guessed it. In fact, in this instance make it lightning quick. For his part, Foo was nonchalant about the goal, which I will add also came against a darn good goalie in Parsons. "I was planning on going backhand and I saw that there was nothing there and I was able to react quickly and pull it back to the forehand," said Foo. "I guess it looked good." Later, the 6-foot-0, 185 pounder showed he can be a handful to contain when he is determined to get somewhere. On an innocuous play near the side boards, Foo bursts right past defencemen Kayle Doetzel and Kylington with a power move, only to be robbed by Parsons. After it looked like he had beat him with a deke, the acrobatic goaltender sprawled and flipped his arm back to steal away what appeared to be a sure goal. "Thought I'd be able to get it around him, but that's a typical Parsons save right there, just diving back and grabbing it." Treliving says he likes what he's seen so far from the Hobey Baker finalist from last year and now the onus is on Foo to keep working and get himself ready for September. "Expectations are he'll go to rookie camp and he's got two months to push like a son-of-a-gun to make sure he's ready," said the GM. "For a lot of these kids, you come in here, this is a step up for a lot of them. "The ones that come back in September, now the big boys are going to be here. It's a different group on the ice come September so you've got to be ready for that physically and I think he will be. Then we'll just go from there." Foo, who comes across as a cerebral guy, says he got a lot out of the five-day camp. "This lets you know what you've got to work on and get a little bit better at," said Foo. "You see what the other guys are excelling in and you want to be right there. It gives you a little sense of what you've got to do for the rest of the summer." A pleasure to watch because of his non-stop motor is Dube, one of Calgary's second round picks in 2016. Due to his last birth date, he'll be back in Kelowna (WHL) next season. But on Friday he showed why a year from now, he'll definitely be turning pro and is someone that fans should be excited to see perform at the next level. Listed at 5-foot-11, he's not an overly big guy but he's got great offensive skills, is a quick skater, always drives hard to the net and he can change directions on a dime. Also, he's an absolute pitbull on the backcheck. Opponents can probably hear his gnashing teeth as they try to fend him off. All of those skills he put on display on Friday morning as he was his regular burst of energy. He drew a penalty shot in one sequence but he was unable to score on it. 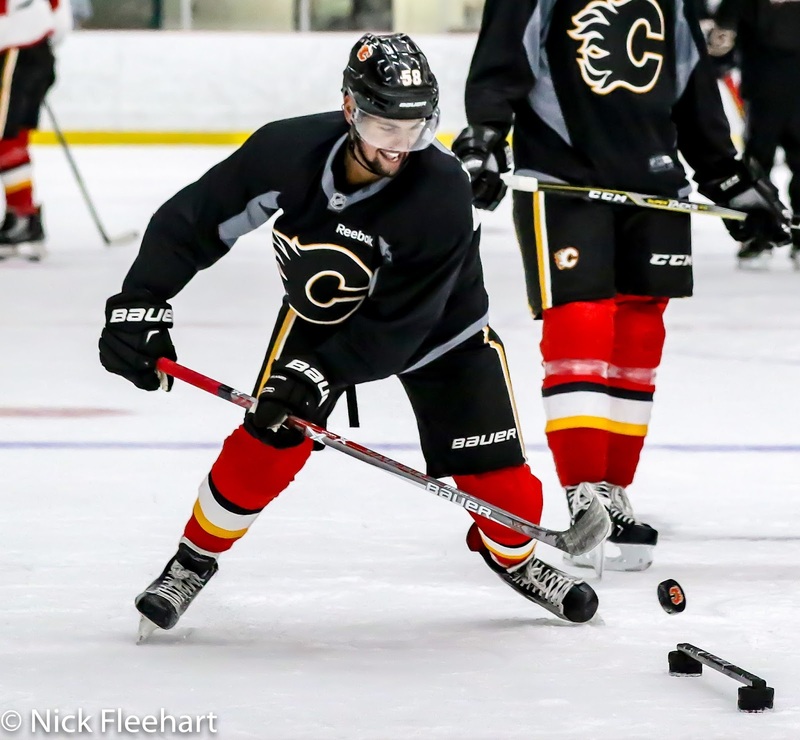 Later this summer, Dube and his Calgary training buddy and fellow Flames prospect, Matthew Phillips, will head to Canada's World Junior camp. Relegated to a fourth line checking role on last year's national team, he embraced that responsibility and had an impactful tournament. "I was fourth line and everybody questions how it was and it was the most fun I've ever had playing hockey," said the personable Cochrane native. "It's almost more enjoyable because I don't have as much pressure and I just get to go out there and play and enjoy it." He realizes that ultimately to have success in the NHL, that defensive side of the game is going to be important, not just being a top-line scorer as he's been with the Rockets. "To be able to play both roles, it gives you a chance to play at the next level earlier. But if I go back there and play that role again and do what I do in Kelowna, it just shows that I can play a 200-foot game," Dube said. The other focus this season for Dube is becoming an even greater leader. "It will be my fourth year in the league and I really want to take that on my shoulders, not just scoring goals, I want to be a leader," said Dube, who turns 19 later in July. "I want to be that guy you look to that has a letter on his chest and takes pride in wearing that jersey." As a final wrap, here are a few thoughts on six others not mentioned in today's piece, who got their name scribbled in my notebook. LW Andrew Mangiapane - Was my Thursday feature so for more, see below. Basically, he's a sixth round pick that right now looks a second round pick. Not a bad investment of 166th overall just two years ago. Terrific hands, when he gets the puck on his stick, it stays on his stick a long time. Very assertive with the puck, confident. He'll get some NHL games as early as this year and certainly has a shot of sticking at some point down the road. 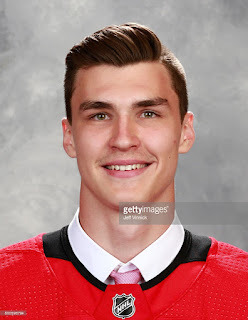 Played a lot with Ruzicka in the scrimmage so make that another potential future pairing. RW Eetu Tuulola - The star a year ago, didn't stand out in the same way but that's not a negative. Again, one semi-competitive scrimmage is not a lot of runway. You saw his shot a couple times on Friday. Hard and with a quick release. Is returning to Finland to play pro in the main Finnish league so by no means is his development being hurt by leaving the WHL. Note that Finland doesn't play in international-sized rinks, they play in a hybrid so any future transition won't be that big of a deal. D Rasmus Andersson - It's no secret that Andersson is a real talent when he has the puck on his stick. That part of his game is excellent and NHL-ready in my opinion. Always ready to jump into the rush, he is involved in the play a lot but unlike his more wiry countryman Kylington, that comes without the glaring gaffes. He even added a pretty shootout goal, which he put an exclamation mark on with a little stick salute. A character off the ice, no need to rush him to the NHL yet, continue to give him those hard match-ups in the AHL and evolve his game defensively. But this time next year, now we're talking. As for his conditioning, I didn't hear much. He's always going to be a thicker guy and will have to work on that part of his game but he seemed to be getting around the ice just fine. RW Max Veronneau - Another Ivy League kid, who just completed his second year at Princeton in which he doubled his point total to 35 points (11 goals, 24 assists) in 33 games. 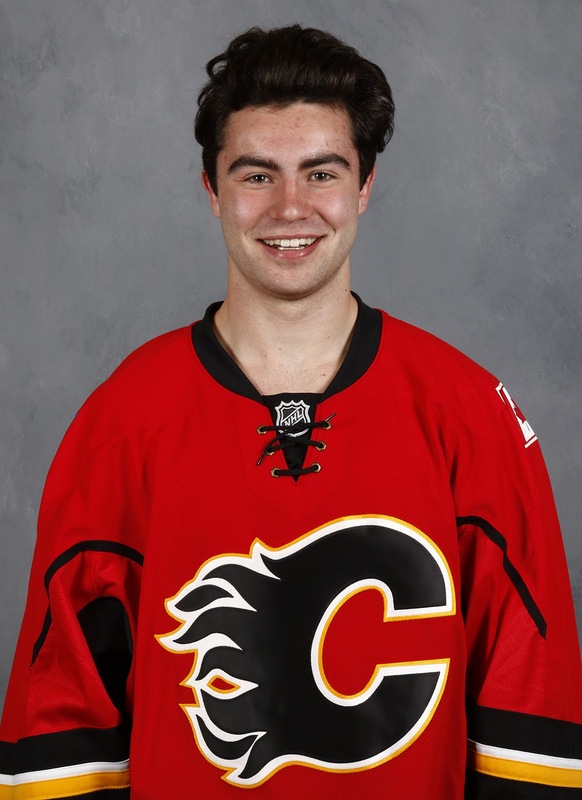 There were a lot of players on try-outs and it's a lot to digest but of those 16, the 21-year-old Veronneau was the guy most noticeable for me. Involved in the play, around the net, it was his nice cross-ice feed that set up Kylington's goal. Worth noting is that both Foo and Healey were at Flames development camp a year ago, only to sign this off-season. We'll put his name aside for later. 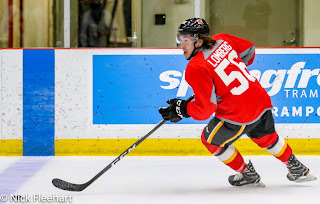 LW Ryan Lomberg - Considering some of his off-ice struggles early in his hockey career, to see him as one of the older players and leaders at this camp, he's already quite the success story for me. You love watching him play as he's scrappy, he'll go up against anyone, he hits, he's like a dog on a bone with when chasing the puck and he just plays without fear. Plus, he has some offensive skill to go with his pest-like qualities. Another guy I'd suggest is a longshot to make the NHL but will be a real popular player in Stockton both with the fans and with the guys in the dressing room. G Tyler Parsons - He said all the right things in camp about the possibility of returning to the OHL but there is no way he is going back to major junior. 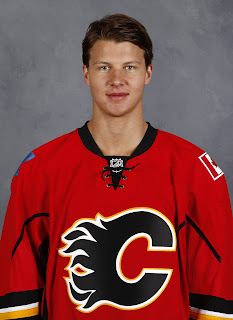 He has done all he can at that level, this is a dynamite prospect for the Flames that they are real excited about. They need to bump him up to the next level to continue that development and that is likely Calgary's ECHL affiliate in Kansas City. He is so dialed in when he plays, he fights like mad to track the puck and will do anything and everything to keep the puck out. Think Jonathan Quick and you'll get a sense of this guy's style. Very polished off the ice too, he's the full package. 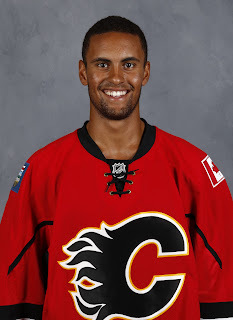 Lastly, I'll leave you with a three-minute highlight reel from the scrimmage, courtesy of Calgary Flames television. Have a great summer and thanks for reading! Excellent summary. Detailed. Good to hear about Fischer. I have a feeling he'll be w/the big club in Calgary, down the road. Has been a hunch for a bit, which now has hope, since we actually drafted him! I hear from others Roupp looked interesting... Healy's another who could be a real steal. Fischer is a unique situation. Undrafted twice, about to turn 20. Could be nothing more than another Austin Carroll, late pick on a guy that could be ready sooner but as an older guy, usually there's less development to go still and they may plateau at below-NHL level. We'll see. Has certainly re-invented himself as a rugged player, who can score. Power forwards will always get a chance because teams love to have them. As for Roupp, saw him out there, didn't really do anything amazingly good or bad for me, but a microscopic sampling. We'll see who they bring back for rookie camp, there will probably be a couple. He had his share of injuries early in his career. I get a sense he may be like Lomberg - a potential mucker, if he [Fischer] can skate as well as Lomberg. But the comparison to Carroll, who I also like, is one that has indeed crossed my mind. I was at the camp Wednesday and Friday. I agree with your comments. I thought Mangiapane also looked like he may have a chance one day. He reminds me of another Italian that played for the Flames, Cammalleri. Mangiapane has performed so far like what you might expect from a second round pick. Still no assurances he becomes an NHL player but he's certainly elevated his stock from when he was taken in the sixth round. Doesn't strike me as a high-end prospect at all. Has never done much to move the needle. Spent most of last season in the ECHL. Maybe he'll find his way eventually and he did score a goal on Friday but until this point, I haven't seen any reason to consider him a top-20 prospect. I'm really hoping they give Adam OM a chance; his hockey IQ and physical style can help him make up for some of his skating shortcomings. If you see Valimaki and Fox as future partners who do you see with Ras? I think Ras and Fox play very similar games. Sounds like the ball is in Ollas-Mattsson's court, not the Flames. I think Valimaki and Fox could be future partners but I didn't exactly spend half-hour whiteboarding that. Could be Andersson too. If they re-up Brodie when he comes due (as same time as Stone, Hamonic), maybe it's him. Great rundown. I hope you are heading to Penticton this year. We can't make it, and really relying on some good live opinion. Will catch as much streamed as possible.